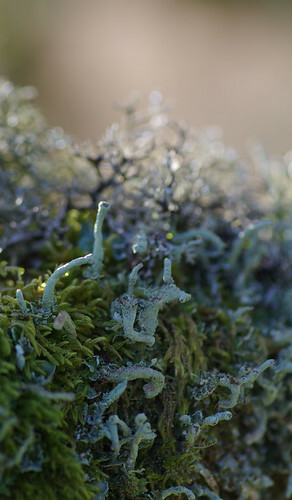 The last time we went to Wistman's Wood, the place was crawling with photographers. It had just won the dubious accolade of one of the top ten photographic locations in the UK. I can't remember the publication but a lot of people must have read it and recommended a trip to their friends. Everywhere we looked there was expensive full-frame gear perched on sturdy tripods. Armed with just a superzoom and a border collie on a lead we must have stood out a country mile. There is something special about this mystical place. The stunted, twisted trees give the place an aura that is hard to decribe. But as usual I'm jumping the gun. Things had not gone entirely to plan that day. After a series of delays, we started to wonder if we had made the right decision; if it would have been wiser to select somewhere closer to home. It was already well into the afternoon when we arrived. And while I always believe in being prepared, I had not counted on needing a head torch. 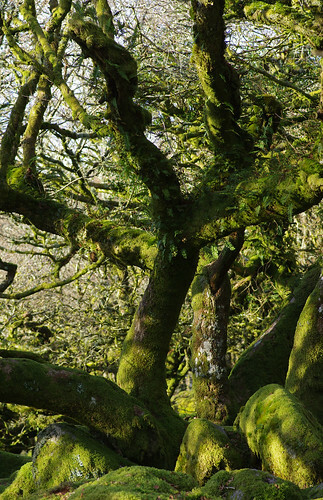 Wistman's Wood is only a couple of miles from Princetown as the crow flies. For us bipeds, the path starts across the road from the Two Bridges Hotel (an excellent place to enjoy a coffee and welcome warmth by an open fire). We only got a few yards without getting distracted. The fact that we came upon drystone walls at nearly 400 metres above sea level could only mean one thing: new lichen species to record. Conditions, though, were far from ideal. We were walking straight into a stiff breeze from the North. Although Wistman's Wood is situated in a valley, and therefore relatively sheltered compared to the surrounding hills, we felt the cold even hunkering down low by the stone wall. I'd also foolishly left my gloves in the car. So much for being prepared! This is the species also known as 'Devil's Matches'. 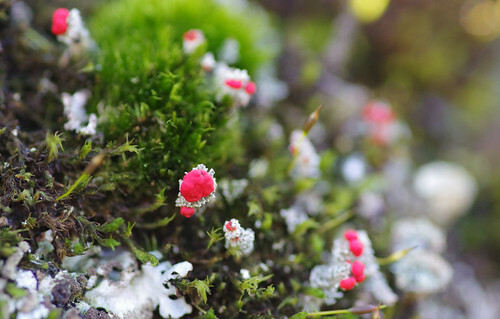 Cladonia bellidiflora is similar but tends to be taller. One source of consfusion has been that these have different states. I had always assumed (wrongly, as it turns out) that the red-tipped apothecia belonged to one species and the neighbouring cups (podecia) to another. In fact, the same species can possess both. 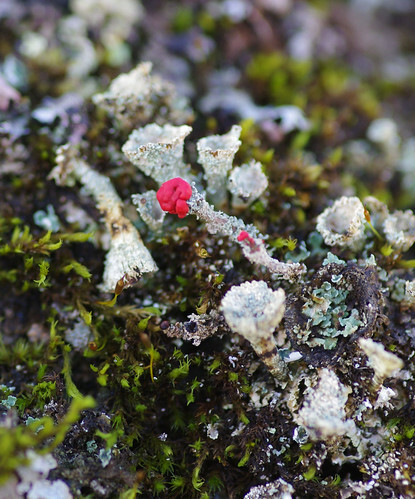 At the lower middle of the image above, you might just be able to detect the red apothecia growing out of the top of a cup-shaped podecia. There are cups around it and very few squammules in the soil. With so many different miniature forms at close quarters, Sherry found it harder than usual to frame a composition right and keep everything still. Many of these shots were a bit rushed because it was imperative to keep moving towards our destination. We will undoubtedly return to spend more time recording these species. On the top of the stone walls, we were spoilt for choice. Virtually everywhere we looked, there was something new to try and make sense of. This species commonly has hairs at the tip of its leaves. There are none present in the image although the leaves do possess points that are almost as fine as hairs. I am convinced it is more likely to be Bristly Haircap than Juniper Haircap. At last we turned our attention from the stone walls, and strode out across the peaty ground. Part of Wistman's Wood was fenced off (to conserve the area and let things take their natural toll). Before the fence there were plenty of trees (and moss and lichen species) to investigate. 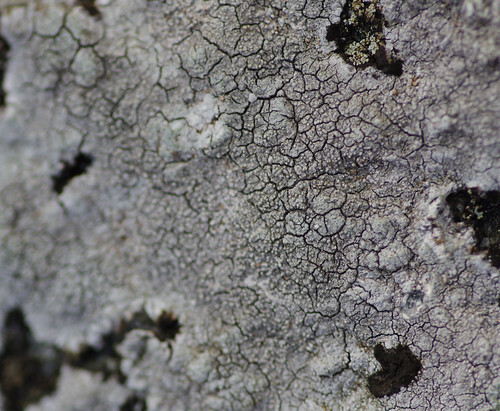 This lichen has constricted sections like joints (hence the name). 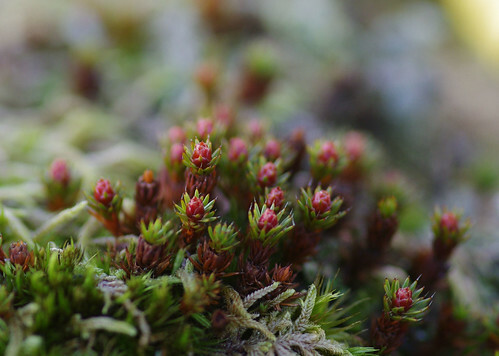 It is found in Western parts of Britain, in unpolluted moorland areas. The trees were literally teeming with life. I could not help thinking that some of these miniature forms were also tree-like. These contorting, almost snake-like forms were growing among a soft cushion of mosses along a branch. Squammules were present here and there; their undersides paler than above. It was hard to retain any level of concentration. There was something weird and wonderful to behold whichever way you turned. 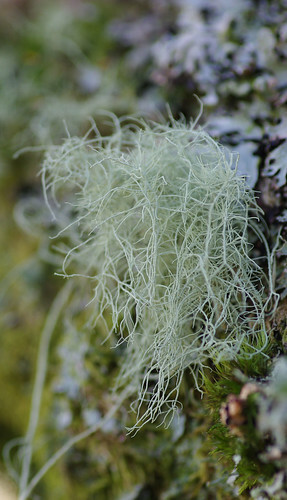 If I had to guess, I'd say this could be Usnea flammea. We will have to go back for this one and take a closer look. 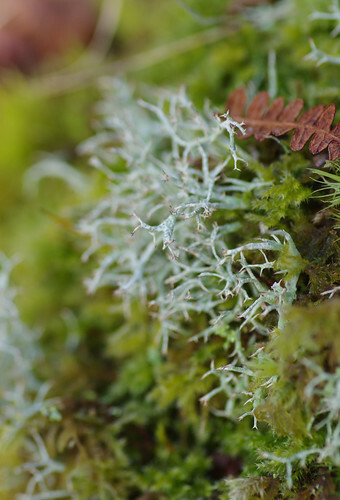 There were rich pickings among the mosses. 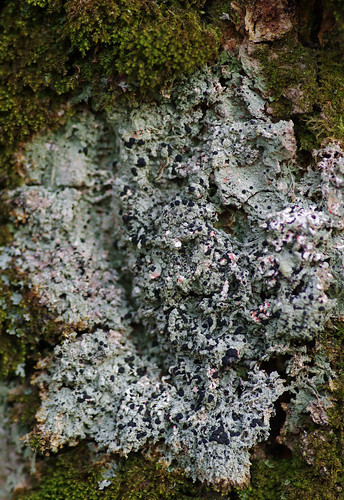 But by the bases of trees, where the granite boulders were not covered in cushions of green, they were covered in lichens instead. We sat on one of these boulders and munched our way through lunch. In this magical landscape, we surveyed the many twisted forms ahead of us. It felt like the realms of fantasy were before our eyes. I half expected to see hobbits. With legs dangling and heartily tucking into packed provisions, it was easy to feel a bit hobbity, too. I like the shallow depth of field on this image. A small part is in focus but that should be enough to identify the species. Thus far, my search has not yielded any answers. We'd never seen anything like the specimen above. 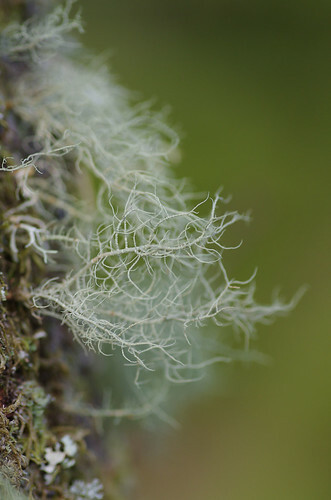 The lobes are thicker and fleshier than a Parmelia lichen. With distinctly upturned lobes, a brown underside and the shape of the lobes, I had high hopes of a direct match. Apart from the discrepancy in the thickness of the lobes, it closely resembles Hypotrachyna afrorevoluta. But that species is found on trees, not growing on rocks. This one has a much better 'giraffe neck' pattern when looking at the stems. 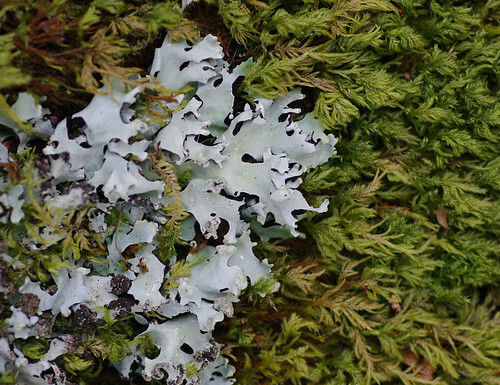 Of course, in this rich and varied habitat, it was not only lichens vying for our attention. 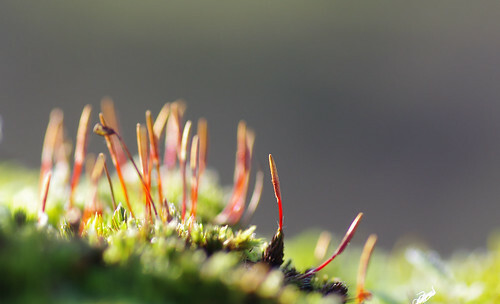 On virtually every rock, mosses were there to be recorded. 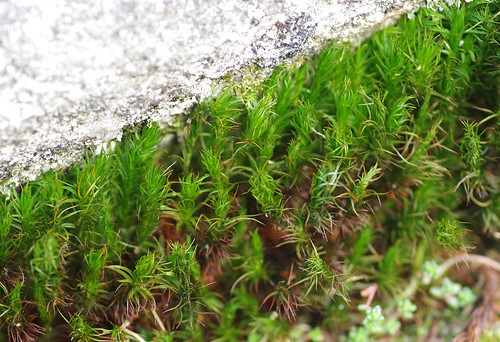 Nestled in a rock crevice, these mosses made teasingly recurring patterns. The leaves were long, narrow and frequently bent. At intervals, there are pale rings along the main stem, and more rings where the side branches are connected to the main stem. This lichen appeared to be growing on rock. 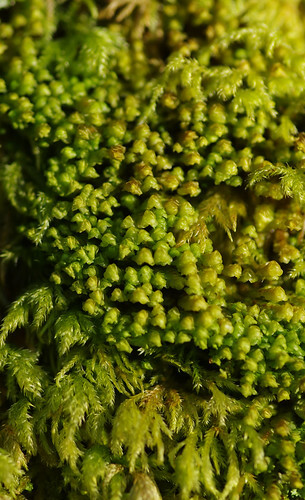 I'm not sure whether the mosses surrounding it are keeping the level of growth in check or if the mosses themselves are unable to grow on this thallus. 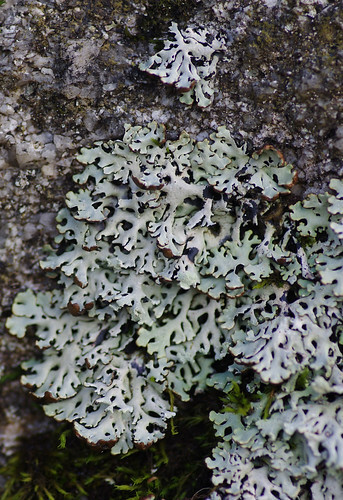 This was a bluish-grey with branched, black rhizines under the lobes. Some of the lobes were grey and sorediate on their tips. 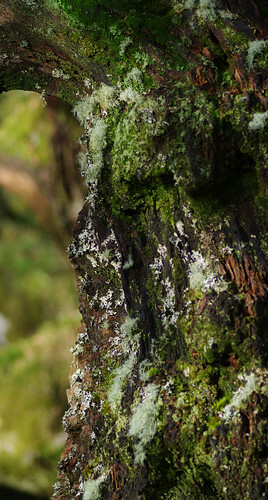 Pointing in the same direction, this lichen and the mosses seem to complement one another perfectly. 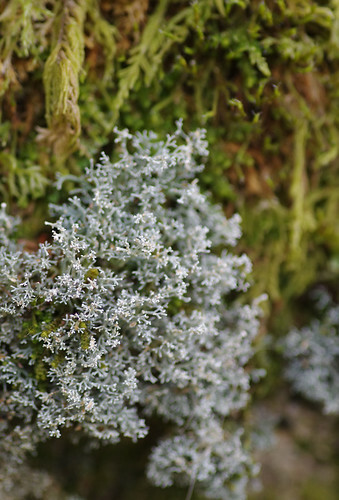 This coral-like lichen was a lot paler than it was supposed to be. It must be Sphaerophorus globosus as there are globular parts at the branch tips (albeit white and not textbook black). These specimens were a decent size, which immediately ruled out many smaller species. 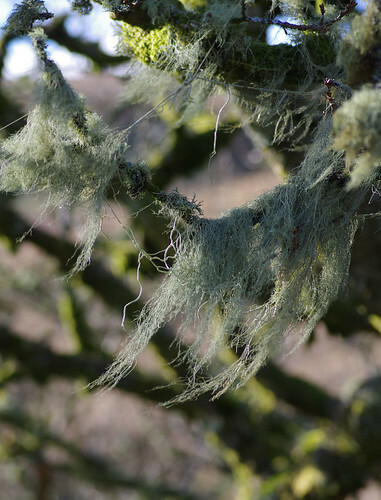 Sherry selected this tree as an example of just how many moss and lichen species can cohabit on the same trunk. The trunk almost looks rotten from this distance. It might have been in this state for many years, weathering storms. I wonder if these trees, being anchored to their roots in rocky ground have an advantage in rough weather. Being stunted, are they better protected from the gales? 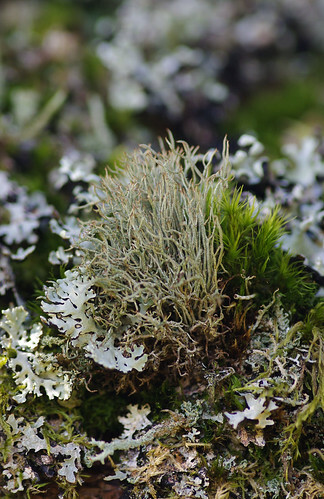 This is probably the same Cladonia species as the one I could not identify earlier on. 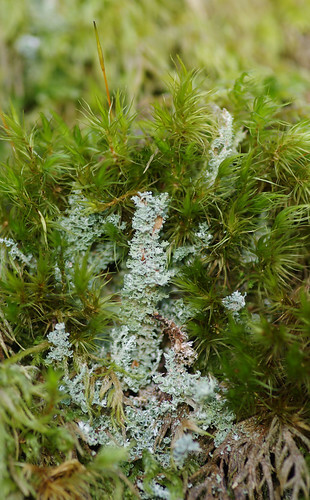 This one is covered in squammules, to the extent that I'm suspecting it might be Cladonia squamosa. 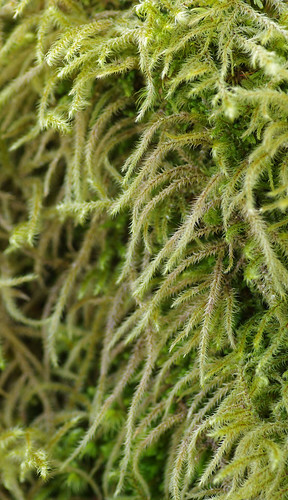 Finally, there was one last moss texture to inspire and confound us. It was high time to be heading back. But naturally there were a few distractions as we began our return; conscious that there was not much daylight left, and determined to make the best of the last hour or so.